We assume that if there is nothing morally or legally wrong with a decision then it’s OK to move in that direction. There is nothing legally wrong with taking a higher paying job or making that business deal. We can move to another state with ease and even find a handful where drug use is even legal. Dating someone who has different religious beliefs than you is legally acceptable. So is letting your teenage son host an all night party while you are out of town. OK…that last one may never be a good decision. But you get the point. Granted, in many situations we are just trying to get ahead in life. However, in others the “can-I-get-away-with-it” attitude leads us to push the envelope. We get as close to the line as possible without stepping into the danger zone. This is the not the right approach in how to make a good decision. As a follower of God I want wisdom to define my life. So asking the “What is the wise thing to do?” question is a natural outpouring of something I’m already trying to accomplish. But whether you are religious or not the question is still valid. You respond to life decisions based on whatever worldview you hold. And no matter the worldview, we all want to make good decisions. So it can and should still be asked — it’s not an exclusively spiritual concept. …being less able to rationalize our decision. Those are all issues I’ve faced in the decision making process. The question is worth asking just to diminish those issues. “What is the wise thing to do?” is too broad and bland of a question though. It really is only the starting point. To really gain clarity on making good decisions we have to dig deeper with the question and look at it from three different angles. Tell me about your past decisions? Do you have a track record of taking risks and then falling flat on your face? What decisions or life situations have shaped who you are or where you are at today? This angle causes us to evaluate our past. We gain a lot of wisdom from analyzing what we did right or what we did wrong. That information can then be used to bring clarity to the current decision we are trying to make. The key here is to only analyze OUR past. This is about us. We are not asking, “What have others done?” We have to focus on our history to avoid comparing ourselves with others. What are you going through right now? What present circumstances might change or alter this decision? Is this the appropriate time to be making this decision? Timing is a big deal. We’ve all had a deal cross our desk and were frustrated and confused because the timing wasn’t right. In some cases we waited on it. In others we pushed ahead because it was simply too good a deal to pass up. The truth is you can always pass up a deal if it doesn’t fit with your current life situation. This is especially true as it relates to our emotions. Are you able to make good decisions when you are angry, sad, depressed, or bitter? I’m not. Good decisions don’t flow directly from emotional pain until we’ve dealt with the pain on some level. What plans do you have for your life? Is there a personal mission statement guiding your every move? Our problem is that we often make innocent or bad decisions that undermine the progress towards our stated goals. We handcuff ourselves by not making decisions that facilitate what we want to become. It’s not intentional, because really – who wants to sabotage their own dreams? But because we haven’t asked the right questions that is often what happens. We never reach our desired future because of unwise decisions in the present. Follow through – based on those answers. You could work through this entire process and come to the wrong conclusion because you didn’t answer the questions honestly. Or you could have been honest but lack the courage to follow through or simply refuse to follow through based on your conclusions. Whatever issues you are facing this template will teach you how to make a good decision. Will it be possible to make a good decision every time? Maybe not. But we will certainly get closer to that mark the more we spend processing it in this way. And who knows…after years of engaging in this process maybe all of your decisions will be good ones. And now it’s time to give credit where credit is due. You may have noticed earlier I mentioned that I couldn’t take credit for these questions. While I have practiced them at some level in my life, I’ve never before had them clearly defined in my mind this way. That is until last year when I read the book Ask It by Andy Stanley, pastor of North Point Community Church near Atlanta. As the subtitle of the book says, “What is the wise thing to do?” is THE question that will revolutionize how you make decisions. Of course Andy goes much deeper in his explanation of these concepts. I’d highly recommend the book for someone who wants to understand the principles of making good decisions further and see how this question can be applied to specific life situations like money, relationships, careers, etc. Questions: What do you think about the broad question and it’s three clarifying brothers and sister questions? How do make a good decision? 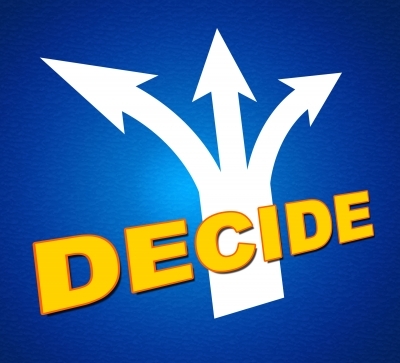 Do you see any problems with making decisions this way? What decision do you regret and wish you could do over again? If you are someone who lets emotion into your decisions, you will have a hard time letting go of the emotional side of the choice. I know all about that. There have been many times I knew the wiser thing to do, but I let my wants get in the way. Little by little I created what would become a life changing event in the form of Bankruptcy. I was only looking about a day ahead, because I didn’t want to accept what I was doing. I’ve got a good grasp on considering the future when making a decision (ok, I could still use help remembering) but the question that I think is revealing is considering my past. So many times in our culture w’re told to never look back and to only look forward. Taking a moment to consider my past responses and maturity makes a lot of sense. You’re makig me think today! I think there is a difference between remembering the past and living in the past. The first helps us process our responses, learn and move forward as better people. The latter keeps us stuck, never learning from our mistakes and at best treading water. Brian recently posted…Is Investing in Collectibles Like Valuable Baseball Cards Worth It? If I am making a big decision, I always ask myself to look at it as if it were 5 years down the road. What would life look like in both cases – making the decision to do something and not. It really works well in most circumstances. For example, should I put in 10 more minutes of networking, or watch TV? Well in 5 years, watching 15 more minutes of TV won’t really do much for me. But networking for 15 minutes could lead to some big things so I’ll go ahead and network. I love that strategy Don. Projecting down the road is definitely part of the equation when deciding between options. Thank you so much for such a thoughtful post. Love this, Brian. That is a great question(s) to use to guide you to best decision. As you said, we often make decisions from an emotional place, which unfortunately tends to guide to not-so great decisions far too often. But when we have these kinds of questions to ask ourselves, it really does help us slow down and think through our answers and hopefully come to that wise, clear and right decision. And I agree wholeheartedly that being honest in answers is so important, even when the honest answer is maybe not the answer we want to hear. It’s the one we need to hear. “…even when the honest answer is maybe not the answer we want to hear.” That’s probably the toughest part to this whole equation and what keeps some people from moving forward. Something I probably should have added but didn’t is that it helps to get honest feedback from others. There have been times in my life when I sought advice from others and I knew they were less than honest (or simply held back for whatever reason). That doesn’t help me make a quality decision. I was wondering why your message seemed so familiar and then I realized that it was Andy Stanley! I have a client/friend who attends his church and told me about this a while back. I think it’s a great question to ask and more than that, it’s the process of analyzing your choices before you actually make them. If you take the time to question yourself, you are more likely to make better decisions than spontaneous, thoughtless choices. Shannon recently posted…Do You Have Financial Vampires? Haha…I really appreciate his work. The book is so good…I barely did it justice here. But I never wanted to forget the lessons from it and I wanted my kids to hear it so I just had to summarize what I’d learned. I like this: “In light of my current circumstances, what is the wise thing to do?” Decision making is something I’m experiencing a lot lately. Do I go back to full time even though that kind of work makes me unhappy? Or do I stick with freelancing and following my passion and hope the money eventually follows?” Even using that question you posed, it’s still not that easy, because if it’s about my present money situation, the answer would be yes, but if it was about how my heart feels, the answer would be no. I think taking risks and making mistakes are part of life and need to be experienced to some degree. I think sometimes people fall too far in the other category and never make ANY decisions based out of fear. Tonya recently posted…Fortunate, or Spoiled? You are right…it’s not an easy decision. In your case the first two questions sort of fight against one another. Based on your past experience the wise thing to do is to stick with freelancing because you hated your old career. But your current circumstances (i.e. need for money) suggest that you should go find a full-time job even if it’s not exactly what you want to do. It would seem the tiebreaker is going to be the third question…what are your future hopes and dreams? Will you be content to continue what you are doing even if it never pays off? I like the asking if that was a wise thing to do beforehand, just need to slow down sometimes and not make the quick, snap decisions. If you can take that approach I think you can avoid a lot of regret. “…need to slow down…” I agree Brian. These questions force you to do that. Way too many decisions are made at a snap of the fingers. We all need to think more before we act. Many times, a good trick is to visualize your life with the decision you’ve made, and see how things look and how happy it makes you feel as you’re visualizing things. Hunches are often correct, and this is a good form of getting a hunch about something and trusting your hunch. I like the visualization technique MB. Using imagery to project an outcome is powerful. I used it frequently in high school when I was training for basketball. Seeing what I wanted to become helped drive me to get up early in the mornings and go run or shoot baskets. Asking what is wise beforehand is always a good idea. I don’t see how you can go wrong if that is your strategy. I have made *many* mistakes in life, but they have become a lot fewer now that I am older and can look at the big picture. “…now that I am older…” Agreed Holly…Experience is a great teacher.